The turmoil that erupted in Juba last month threatens to ignite a full scale ethnic civil war. If peace talks fail, a potential genocide may even result. South Sudan’s economy is the world’s most oil-dependent, with Juba’s oil exports accounting for 98 percent of the country’s revenue (as of January 2012) and approximately 80 percent of its gross domestic product. South Sudan’s GDP per capita of just $1,100 ranks low even by African standards, so control over oil production is naturally a contentious issue. When rebels seized control over the strategic town of Bentiu (the capital of the oil-rich Unity Province) last month, fears that a full scale war would erupt were a source of great concern. As is the case in Libya, South Sudan’s government knows that it will lose power if non-state actors seize de facto control of the petroleum production facilities, as the national economy is held hostage. Economically, China is the foreign country that stands to lose the most, either if the violence persists or full scale war breaks out, as the China National Petroleum Company (CNPC) is the largest foreign investor in South Sudan’s oil industry. In 2012, approximately 80 percent of South Sudan’s oil exports went to China. 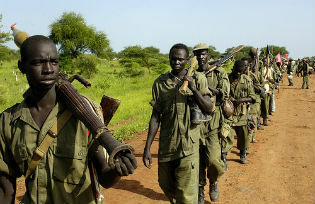 When forces loyal to President Salva Kiir and former Vice President Riek Machar began fighting last month, the Chinese government grew particularly concerned, and is currently trying to broker a deal between the government and Machar’s rebels. Since the early 1990s, China has invested heavily in Sudan’s oil industry. After the 2011 partition, 75 percent of Sudanese oil fell under the control of South Sudan, and the Chinese were forced to accept that the majority of Beijing’s investments in Sudan were no longer under Khartoum’s control. Since Juba’s independence, China has sought to maintain its alliance with Sudan while establishing a close partnership with South Sudan, ultimately to ensure a continued flow of oil to China. This objective grew increasingly challenging when tensions between the two Sudans prompted Juba to shutdown oil production from January 2012 to March 2013. The sources of hostility included border demarcation, ownership of the oil-rich Abyei region, transit fees from Sudanese pipelines, and Khartoum’s allegations that Juba sponsored militias in southern Sudan operating against the Sudanese regime. In contrast to Beijing’s traditional ‘non-interference’ approach to foreign affairs, China played an active role in pressuring both Khartoum and Juba to resolve their disputes and resume the flow of South Sudanese oil to global markets via Sudanese pipelines. Beijing substituted the oil that it lost from the standoff between Sudan and South Sudan with imports from Angola, Russia, Venezuela and several Middle Eastern countries. China’s diplomatic efforts underscored the conflict between what had been Beijing’s traditional ideological pillar of non-interventionism and becoming embroiled in foreign conflicts in order to secure access to natural resources. It can be assumed that China will continue to diversify oil imports and decrease its dependency on Sudan/South Sudan’s oil supply in light of escalating threats to Chinese interests in South Sudan. On December 20, the CNPC evacuated its workers to Juba and nearly 200 oil workers sought refuge at a UN base to escape the bloodshed. As White Army militants can be expected to continue attacks on the strategic oil fields, China realizes that its economic interests in both countries may be jeopardized for some time to come. But Beijing has also stated its interest in promoting a negotiated settlement to the conflict, similar to its mediation between Sudan and South Sudan during 2013. Yet with its variety of options for oil imports and tradition of non-interference in the affairs of other states, it remains to be seen how much effort Beijing will ultimately invest in restoring stability to South Sudan. Sudan also has economic and security interests at stake in South Sudan. Whereas Sudan’s 2011 partition placed 75 percent of Sudanese oil outside of Khartoum’s control, Sudan secured leverage by retaining control over the only pipelines capable of transporting South Sudanese oil to global markets. While the standoff was partially driven by Sudan’s interest in utilizing this pressure over South Sudan to attempt to score concessions from Juba (related to transit fees and border demarcation), Sudan ultimately stands to lose out from a prolonged shutdown of South Sudanese oil, given the lucrative transit fees that Khartoum could gain should South Sudanese oil production reach maximum capacity. Although Sudan seeks to finalize a permanent border demarcation agreement with South Sudan, such a resolution is not possible while South Sudan is immersed in civil war. While South Sudan has had a turbulent, hostile relationship with Sudan, the two states clearly have mutual interests in keeping the oil flowing. Sudanese president Omar Hasan al-Bashir understands that his own power circle has much to lose from decreased oil production levels in South Sudan, which is costing Khartoum revenue at a time when economic crises across Sudan fuel greater resentment against the ruling regime. Ugandan President Yoweri Museveni also views the prospects for a civil war in South Sudan as unsettling. Since South Sudanese independence in 2011, Uganda has sought to position itself as an influential investor in the new country by integrating road, rail and energy infrastructure with South Sudan. Such investment will clearly be undermined by long-term instability in South Sudan. Given that Uganda’s oil fields are situated within 200 miles of the South Sudanese border, Uganda’s emerging economy similarly has much to lose from any spillover effects of the conflict. Museveni has stated that Kampala wants to play an active role in pushing both sides toward a peaceful settlement. Moreover, if the White Army militia does not abide by any ceasefire, Museveni hinted at a Ugandan military campaign to disarm the rebels. Kampala is clearly in favor of President Kiir maintaining power and South Sudan restoring greater stability, given Juba’s role as a strategic ally of Uganda. As more than a thousand civilians have been killed and 200,000 displaced over the past three weeks of armed conflict in South Sudan, there is much potential for the violence to escalate should ongoing peace talks fail to yield peace. Part of the reason oil prices surpassed $99/barrel last month was attributable to the violence in South Sudan, underscoring the international ramifications of the conflict. Given that Libya’s oil production level is low and violence continues to rise in Iraq, a full-scale civil war in South Sudan will clearly impact the international oil markets negatively. Since its birth two and a half years ago, South Sudan has endured nearly continuous conflict from its neighbor to the north as well as between its rival tribes. That the historic tension between the Dinka and Nuer was not resolved prior to 2011 does not bode well for the future. The killing of a South Sudanese Army General one day before peace talks began raises questions about the rebels’ commitment to a negotiated settlement, which dims expectations of any resolution in the near or even medium term. Regrettably, political instability and ethnic violence look likely to become South Sudan’s status quo, with potentially negative implications for all of its neighbors in the long term. Daniel Wagner is CEO of Country Risk Solutions, a cross-border risk advisory firm, and author of the book “Managing Country Risk.” Giorgio Cafiero is a research analyst with CRS based in Washington, DC.